The Projector Blog: Travel with Audio Visual Needs Can be a Dream Come True...Seriously! Travel with Audio Visual Needs Can be a Dream Come True...Seriously! Imagine, in a perfect business world, you get up, get dressed and head off to give a presentation in San Francisco. Fresh coffee is waiting for you in the kitchen and a taxi is waiting for you at the curb. You breeze through the check points at the airport because you just have a carry on, and arrive at the conference center with minutes to spare and all you have to do is pick up the remote to the projector and start your presentation. Everything is working and running smoothly and when you are finished, simply zip up your carry on and jet off to Seattle and your next conference. It’s not a dream, seriously! 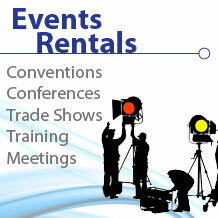 Audio visual rentals can provide you with audio visual services for your functions. Everything you need is sent to your destination, installed, set up and tested and torn down after you leave. No worries, no fuss over inputs, outputs, microphones, the right kind of software, dragging equipment through the airport or the time it takes for you to set up and tear down. Everything is taken care of by your travel tech so you can stay on the move and work more efficiently and even more importantly worry free. Technology rental services can provide computers, LCD monitors, microphones, speakers, projectors and software. They also provide the full service from one destination to the next. So go ahead! Have your assistant book your flight and find a travel tech to take care of the rest and make your working dreams come true. Hi thanks for the tips. The mini-projector is also a great thing coming on, very handy for business traveller. I think the mini projector is gonna be a big thing for business traveler. But this post is still a good tip. Thank you.